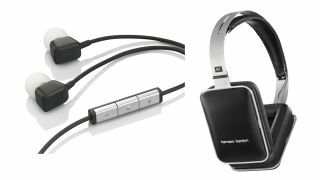 Harman Kardon's latest range of headphones sees the company putting all its eggs in Apple's basket. Not only are the five new sets of cans being sold exclusively through Apple shops and designed to work only with Apple products, the physical shape of the headphones is inspired by the original iPhone. This is most obvious on the two over-ear sets. The ear pieces are boxy rectangular affairs which Harman-Kardon thinks will appeal the premium-loving (and spending) Apple set. The in-ear headphones also feature the oblong covers in a smaller form, as well as 9mm drivers, a dynamic range from 16hZ to 20,000hZ, and an inline-remote that works with iOS devices. The cheaper in-ear NI model will be available from today with a UK price of £89.95 (US $99.95), while the more expensive AE set, which come with better sound quality and malleable Comply foam buds that provide a better seal will set you back £129.95 (US $149.95). The on-ear CL edition headphones are made from sand-blasted steel, with 40mm drivers and the ability to be folded flat. You can remove the cables for easy storage if you're willing to shell out £169.95 (US $199) for a pair. The over-ear Bluetooth BTs are the highest spec of the bunch available today, and are much the same as the on-ear CLs, but with Bluetooth. You can charge them via USB or cable them up if you want to keep listening on-the-go once the 12-hour battery has died. The BT model will cost £219.95 ($249) and a noise-cancelling set (known as NC) will be available in August at some point for the princely sum of approximately £279 (US pricing TBC).